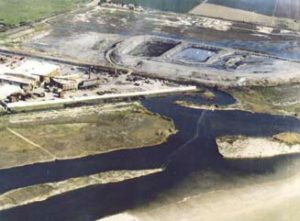 The very first case Channelkeeper took on when we were formed in 1999 was the toxic waste left behind by Halaco Engineering Co.’s dirty metal smelting factory on the Ormond Beach Wetland. Click here to learn more about how we forced this polluter to clean up its operation and ultimately got the site slated for clean-up under the federal Comprehensive Environmental Response, Compensation, and Liability Act (CERCLA, aka “Superfund”). Channelkeeper also forced the clean-up of a parcel of land at the Carpinteria Oil and Gas Processing Facility that contained soils contaminated with high levels of DDT and toxic heavy metals. Click here to learn more.